Powers/Abilities: Nightfall can teleport herself and others vast distances via the extradimensional Darkforce. She also has some telepathic abilities. History: (New Warriors V#7 (fb) ) - Nightfall was a human with Inhuman heritage who was transformed into a NuHuman when Black Bolt detonated a Terrigen bomb. 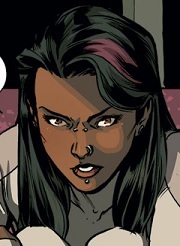 She had some connection with Orollan, a ruined Inhuman city inhabited by the brutal Lash and his group of renegade Inhumans; she had apparently visited it and met Lash. 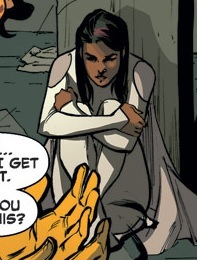 She became affiliated with a small group of Inhumans, composed of herself, Hollow, Fume, Spark, and Jack Chain. They intended to curry favor with Lash by delivering another Inhuman to him. (New Warriors V#7) - Hollow, Fume, and Spark abducted Inhuman hero Haechi and his teammate Sun Girl, then had Nightfall teleport them to an apartment building in Jakarta. Nightfall didn't think Lash would like that they'd also captured the human Sun Girl, and Jack Chain agreed. Later, she sensed Lash's arrival, along with his warriors Nocculus and Sheath. (New Warriors V#8) - As the building burned around them, Hollow demanded that Nightfall give them more time, but she told him that time had run out, and Lash would not approve of him. She sensed the Darkforce-using New Warrior Silhouette, watching her take down Fume and Spark, then apologized to her when Jack Chain took her out of the fight. As Nightfall had predicted, Lash disapproved of Hollow, and killed him; however, he judged Jack Chain and Nightfall worthy, and had Nightfall take them all back to Orollan. Comments: Created by Chris Yost and Marcus To. Nightfall's connection to Orollan is unknown - Lash knew her by name, at least, but I'm not sure if she was from there, or had just visited in the past. Nightfall spends all her on-panel time curled up into the fetal position and leaning up against a pillar, so I can't really gauge her height/weight.